In order that jivas know His divine form, perform His worship and finally attain His divine bliss, Lord Swaminarayan assumed human form on this earth. To spread the pure and true knowledge about His divine form and various other aspects of spirituality, He specifically discoursed speeches. The compilation of these speeches after due editing by the five great sadgurus like Gopalanand Swami etc. is known as the Vachanamrut. It provides practical and radical solutions to various mysteries and questions of life. Again, there are many words which either because of not being in use in current language or because of their linguistic complexity or because of their being of spiritual depth or being vulnerable to be misunderstood require explanation by a person having experiential divine knowledge. Pujya Shri Narayanbhai revealed meanings of such words to his attendants and got them compiled. It is now in the form of the present book. The Vachanamrut! The unfathomable ocean of spiritual knowledge! This principal scripture of Swaminarayan faith is in a collection of 273 discourses delivered by Lord Swaminarayan Himself at various places from 1819 CE to 1829 CE. It is in the form of catechism wherein root questions regarding obstacles in spiritual advancement are answered with practical solutions and striking analogies. It provides solutions on how to eradicate envy, lust, greed, ego, etc., how to know the form of God, how to please God, how to understand the five basic constituents– in short, from the grossest to the most refined aspects of spirituality have been catechised here. Each and every topic in it is as valuable for a seeker as a real pearl is to a jewller. 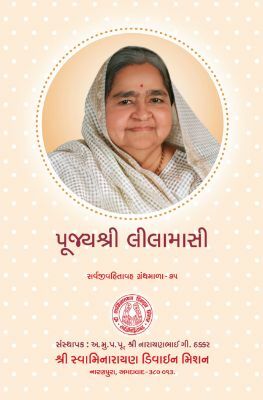 From the ocean of these pearls, Pujya Shri Narayanbhai has selected some precious pearls and grouped them subject-wise for the benefit of the hectically scheduled people of present day. The subject-wise grouping of these pearls would help a seeker strengthen his inclination towards a particular spiritual mode viz. 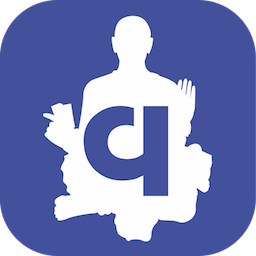 dharma, gnan, bhakti, vairagya, atmanishtha, seva etc. The words uttered by God or His Anadi Muktas are like the ocean of nectar. A single drop of this nectar-ocean is sufficient for a seeker to be illuminated. Pujya Shri Narayanbhai was such an Anadi Mukta. We are fortunate to have a collection of some of his casual speeches. From this divine stream of discourses we have selected some nectar droplets and published in the form of this booklet. An aspirant would find each and every droplet to be inspiring, heart-touching and elevating. These laconic quotes have a smooth penetrating effect on our heart so as not to let us forget the quotes and thereby stimulate us to act accordingly. When Lord Swaminaryan manifested on this earth, people were trapped in various superstitions, malpractices, ill-customs, pseudo-religious rituals. He enabled people to understand true form of religion and to act accordingly. He not only transformed people into human-beings in true sense but also elevated them to attain brahmic state. He charged people with a sense of spiritual fulfilment. When God manifests on this earth, all of His actions –his daily routine or social activities- are meant for infusing into us the virtues like seva, bhakti, humanity, compassion etc. When contemplated, they are capable enough to dissolve darkness of ignorance pervading within us and fill divine light. 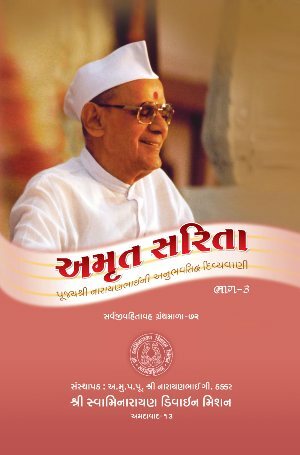 To study about the various aspects of the life of Lord Swaminarayan is indispensable for every seeker. 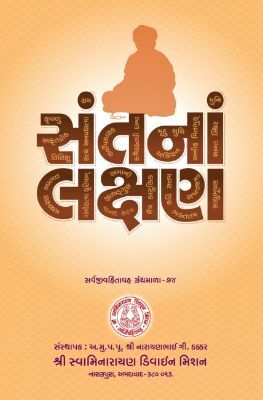 To provide for, Pujya Shri Narayanbhai himself had prepared this booklet and it had been published in Gujarati. In view of the increasing demand from people of other parts of India, now it is being published in Hindi. The Supreme God who creates, maintains and dissolves countless cosmoses and who sends various incarnations to each of these cosmoses when required is Lord Swaminaryan, the highest God. To be united with this highest God is called yoga. The ultimate goal of human life is to be united with the Supreme God. But, man, oblivious of this fact, vainly struggle round the clock for making his life happier by achieving worldly comforts. But he forgets that the highest and everlasting happiness lies in God. So, every human-being should engage in this yoga. An enlightened personality like Pujya Shri Narayanbhai can show us the plain and easy technique of yoga which simultaneously guarantees the attainment of the highest bliss as well as worldly prosperity. This booklet describes the yoga which concurrently goes on hand in hand with our daily affairs and leads us to the bliss divine. 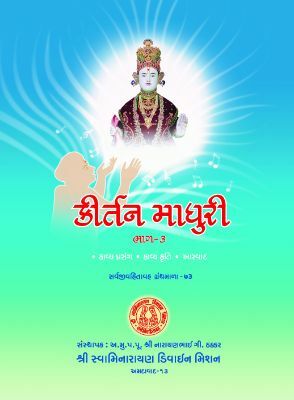 Abjibapashri, the unparalleled Anadi Mukta of the Supreme God, assumed human form just by the wish of Lord Swaminarayan. His nectar words resonate with divine vibrations. His sermons have been a source of spiritual inspiration to all those who are desirous of enjoying the bliss highest. From these words of divinity Pujya Shri Narayanbhai had selected quotations useful all the aspirants of different spiritual level. This booklet contains such 150 quotes. They awaken us, purify us and make us equipped with all the virtues needed to be worthy of remaining established in the form of God. What should be the path of our journey from birth to death as a human-being? The ultimate goal of human life is to enjoy the divine bliss of Lord Swaminarayan. But, unless and until one digests the pure understanding about the form of the Supreme Lord and gets established in meditation on the form of the Lord, one is sure not to attain that bliss. Such understanding can be had from only a person having God-realisation. Such a God-realised person Pujya Shri Narayanbhai used to reveal some esoteric knowledge on various spiritual matters to the group of people who had a privilege to have close vicinity with him and who frequented him and attended him. This booklet contains such esoteric knowledge in simple and short words; but in compact form. There are various scriptures on religious and spiritual matters. The essence of these scriptures cannot be understood without the help of an enlightened guru. The biography of an enlightened person too serves as a scripture. All the actions of an Anadi Mukta are performed by the Supreme Lord Himself. 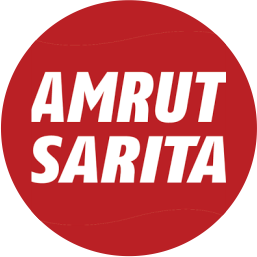 The life of an Anadi Mukta conveys spiritual message. He is a living scripture and a moving place of pilgrimage. We are fortunate we got the opportunity to be in contact with one such Anadi Mukta Pujya Shri Narayanbhai. If we closely observe his any action, it would be found to be in absolute conformity with the principles of Lord Swaminarayan. His every action was for the lesson and benefit of the jivas. 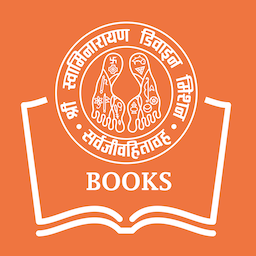 The incidents narrated in this book reveal his lofty spiritual state, his supernatural powers, his modesty, and compassion towards all the living-beings. Despite being a teacher and then the principal of a girls school, he successfully observed his vow of not touching a woman– infant, young or old. Right from the childhood he used to remain in meditative mood. In the Maniratnamala, it is said, (Who is said to have conquered the world? Indeed, the one who has conquered his mind). Swami Vivekanad says, "There is nothing in this universe which does not come under the control of a person who has brought his mind under his control." The mind is so strange and incomprehensible that if it is not employed properly it can be the cause of cycles of births and deaths and if employed properly it can serve as the ladder to liberation. The mindhas ruined many seekers' spiritual forts to dust. So it is extremely important to know the nature of mind, the techniques of harnessing it and then turning it towards God. Pujya Shri Narayanbhai used to say, "Make your mind as deep and encompassing as an ocean. Hide the secrets of spirituality you have known at the bottom of that ocean." This booklet throws light on the properties of mind, its strength, the techniques of mastering it and finally guiding it towards God. 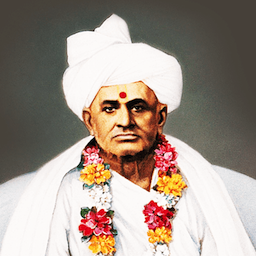 Shreeji Maharaj's contemporary paramhamsas like Muktanand Swami, Premanand Swami, Nishkulanand Swami, Brahmanand Swami, and others were gifted and accomplished poets. 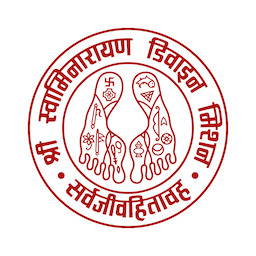 Moreover, Gopalanand Swami, Shatanand Swami, Nishkamanand Swami, Nityanand Swami, Dinannath Bhatt and others were scholars in Sanskrit. Their art of composing devotional songs and shlokas ruled a zenith place among the poets of those days. If mere listening or singing of these devotional songs and shlokas draws us towards the divine form of God, then what would they have been experiencing! These songs and shlokas are not composed by just arranging figurative words, but they 'got composed' intuitively on visualizing God on various occasions. They have enriched their poetry with the description of the greatness of God, His charm and His actions. Bhakti, in the form of singing and listening of devotional songs or stotras, is the easiest way of appeasing God. In this book, it is narrated by whom and how a particular stotra or song happened to be composed and what that stotra means. શ્રી સ્વામિનારાયણ ડિવાઇન મિશન દ્વારા‘સંતની પરખ’ શીર્ષક હેઠળ આ પુસ્તક પ્રકાશિત થાય છે, જે મુમુક્ષુને સાચા સંતની પરખ કરવા માટે તથા તેવા ગુણો પોતાના જીવનમાં ચરિતાર્થ કરવા માટે અતિ ઉપયોગી સાબિત થશે એવી અમને પૂરી શ્રદ્ધા છે. આ પુસ્તક અનાદિ મુક્તરાજ પૂજ્ય શ્રી નારાયણભાઈની દિવ્ય પ્રેરણા અને ઉપદેશામૃતને આધારે તૈયાર કરવામાં આવ્યું છે. આ પુસ્તક દ્વારા સ્ત્રીમુક્તોના રત્નાકરમાં પૂ. માસીરૂપ કેવું અલૌકિક મોતી પાક્યું હતું તેનો મુમુક્ષુવાચકને ખ્યાલ આવશે અને તેમના કલ્યાણકારી ગુણોનું પિયુષપાન કરી તે પોતાની જાતને ચોક્કસ ધન્યભાગી બનાવી શકશે એવી અમને શ્રદ્ધા છે.